Richmond’s Miramar, led by keyboardist Marlysse Simmons (Bio Ritmo) and fronted by singers Rei Alvarez (Bio Ritmo) and Laura Ann Singh (Quatro Na Bossa), specializes in boleros, the romantic ballads that were popular across the Americas in the 1940s and 50s. 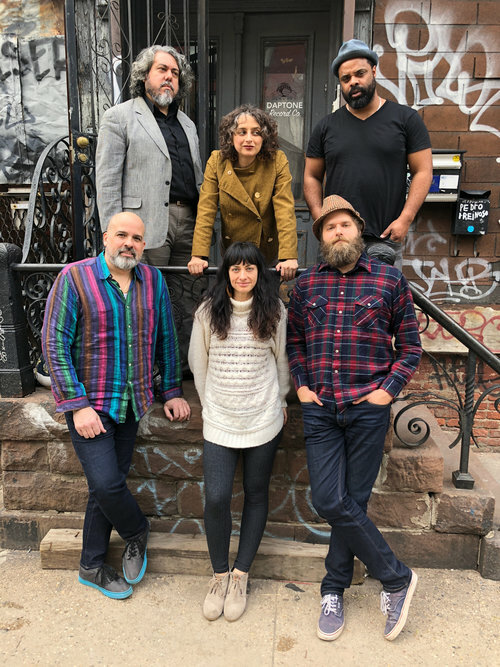 Their 2016 album Dedication To Sylvia Rexach dug deep into the songbook of the proto-feminist Puerto Rican songwriter. Since then, their focus has been on developing their own original boleros. Here are two of them, recorded last year at Brooklyn’s retro, analog-only Daptone Studio, a perfect pairing with Miramar’s so-old-it’s-new-again approach. Daptone is slowly getting involved in Latin music (their debut album for Orquesta Akokan was one of my 2018 favorite albums); Miramar is an ideal fit there as well. The Daptone treatment has treated Miramar well: tempos are a bit faster than we’re used to, Simmons’ organ and Coco Barez’ tambourine on the A side sound like they could be off a 60s bubblegum single, the whole approach lends Miramar a new sense of lightness. The songs themselves, co-written by Alvarez and Simmons, are wonderful, and you don’t have to worry about them being too light – just read the lyrics translation. Outstanding.